Healthy skepticism is what keeps people honest. Healthy skepticism within the paranormal does exactly the same. If done right. A while ago I wrote a blog titled “What cynical skeptics get wrong”. But in recent days I felt motivated over an “interesting” experience with an individual I won’t name. Not because of any possible backlash, but just due the fact that they don’t deserve the notoriety – and you’ll read about why very soon. I happened to be watching an interview and found some of the comments this “individual” was providing quite interesting. So I sent a friend request through facebook. You’ll see often that the first thing many cynical skeptics get wrong, is that for me personally, actually agreed with a lot of what is said. 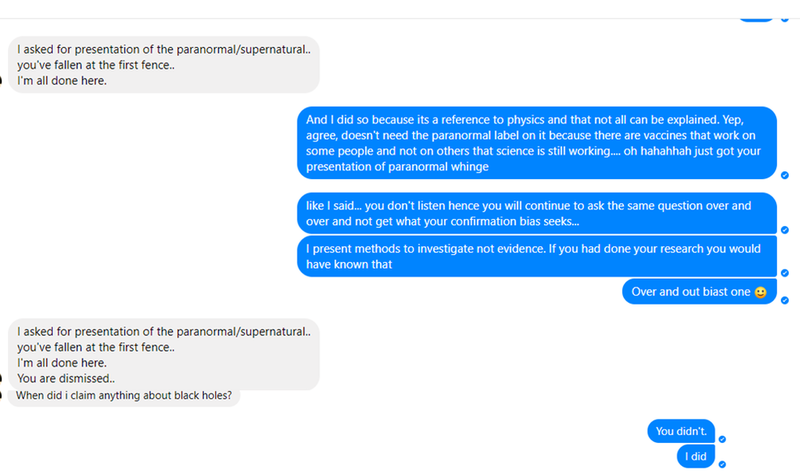 I was then contacted by said individual through messenger with the comment “Hi, any measurable paranormal/supernatural event that you can present”. That’s a big question to ask as many know that the paranormal hasn’t been proven according to science but yet there is substantial research into “unknown phenomena” (ESP, PSI for example) where it may suggest we can communicate or receive information outside of our minds. So, my answer was honest “that’s a very broad question if I might say. What constitutes a paranormal event.. and that it can be something I can present. It is widely known as paranormal phenomena (as you know) which as far as science is structure, the worst kind to attempt to investigate”. Mmmmm. Ok Thanks for the recognition? They then decided to look at my website and quote the fact I was interested in the paranormal for almost 10 years and started in the UK where the interest was more established. They then asked that I “present that… however you put it”. I said I do present it, and around the country and its conjecture. That middle ground is the best way to be about this topic. The paranormal is largely based on personal experience which is difficult to verify. I messaged back to this effect, and then they commented “I’m not interested in the slightest “blah blah blah”. That is when I knew I had a troller on my hands and someone who wasn’t interested in conversation but to dictate what they think I do is wrong. The conversation started to disintegrate further and it actually become quite amusing for me. I think that is half the reason I pursued. And looking at the screen shots below, I answered the question in about 4 different ways, maybe more. The paranormal is many shades of grey with experiences and types of phenomena which can be gathered from all different parts of science to help explain (social science, physics etc). I actually have experience and I’m actually active in my research and field investigations into possible paranormal phenomena, so #jusaying maybe they should listen to someone who does have “actual” experience instead of being an arm chair warrior about this topic. If this individual actually researched my background properly instead of trying to quote a few lines from my website hurriedly they would realise I actually provide information about methods of investigating. Nothing to do with presenting “evidence”. Read below. In all its glory. The only thing that failed in my eyes is that this person didn’t realise they were dealing with an intelligent woman. When they realised they weren’t getting what they wanted they decided to screen shot all of the conversation and post it in a facebook group… you guessed it. JUST for cynical conservative skeptics. So, by this point I clicked to join the group to see what was said but then thought “meh….” And blocked and deleted this individual and went to bed. Why block them? Because I knew there was no way this person was worth the effort in any discussion. My time is precious, and not to be spent “trying” to convince a person. It was over as far as I was concerned and I couldn’t have cared less where they posted what. I stand by all my knowledge and will continue to do so. Blocking isn’t an act of weakness as some would see, but more an act of strength. I’d rather converse with people who are open to listening even if their opinions differ. That to me is worth energy. Not this. But in true bully style, when I then woke up in the morning I had this to contend with. Which isn’t surprising at all. Pack mentality from such a group. After my comment I left the group. If the act of trying to defame someone is considered less than blocking the individual who attempted it? Ah… you can keep your Facebook world of hate, I’m checking out. I think this administrator should be made aware that you have every right to block and ban whomever you want. Someone might need to inform them (sarcasm intended). I also don’t identify as being Christian. It’s not hard to figure that one out either, and even though I’m not, the reference one person commented about is actually religious discrimination. And of course, the pack mentality. When people can’t come back with a valid point in an argument, insults are often used as a last resort. I told close friends who saw this eventuate that it’s all entertainment. For it to upset a person would mean you have a belief in what they say. In other words, couldn’t care less what these people think. So… why on earth would I be posting about this kind of drama? People know I pick and choose my battles very well but this is just an example of the type of anger out there from ill-informed people looking for likes and popularity who represent what is traditionally a great group of people that CAN actually work together – actual skeptics. Truly, not all skeptics are like this AT ALL. I’ve had wonderful discussions with people in the field online (you know who you are!) and also with the lovely people at the Australian Skeptics Society who I will continue to support. Don’t be intimidated by individuals like this. As you can see, I’m not immune to people who chose to function this way. As long as you are active and public, it will happen. But stand behind your information, your material. And know this is a very small majority of people who choose to behave this way. And often after a while they will disappear… to find their next click-bate. The paranormal doesn’t exist. It hasn’t been proven, so there isn’t any danger right? Although the paranormal in its entirety hasn’t been proven, there are people like ourselves who are interested in it and further more actively research and investigate it. There is so much information about the dangers of the paranormal almost anywhere you look, yet they tend to focus on what is perceived as the spiritual danger. Informing people to spiritually protect themselves against discarnate entities – particularly demonic or negative ones. This brings me to my first point. Although we investigate possible claims of the paranormal, the paranormal hasn’t been proven and the dangers of the paranormal, in my mind, don’t start with spiritual protection. So, where would they start? The word danger elicits the thoughts of taking risks. And the biggest risk is investigating in the dark. So many hazards in and around a location is more worrying than being taken over or possessed by an entity. Site walks (visiting a location) during the day and noting hazards round the area is a start but also ensure sufficient lighting while moving around between vigil’s/sessions in the nighttime. Or, if the activity reported happens in daylight hours, ultimately investigate during the day. Public Liability Insurance is highly recommended for all investigators to provide that extra peace of mind no matter what location you are in. Another danger is hoaxing and fraudulent behaviour. It’s a sad fact but it can happen. The paranormal can be very centred at times about personal experiences and interpretation, so in essence, it has the potential to be anyone’s game. Particularly if you are unfamiliar with how easy you can be to be fooled. People who act fraudulently can give fuel to the fire that ALL investigators have ulterior motives in mind. Which isn’t the case at all. Not finding a Possible Alternative Explanation to possible paranormal phenomena is also dangerous. Why? If you think you’ve captured something audibly or visually and present it for all the world to see, don’t be surprised if it’s reviewed somewhat harshly by other investigators. They will naturally be questioning the conditions the footage was taken right down to angles it was shot in and want confirmation of the people in the area at the time. If you find in that time that it wasn’t paranormal, you’ve had to go through this whole process in a very public way. Learning is vital, but not like this. Fear is another danger of the paranormal but not what you think. Some information on the internet states that investigating can be harmful and destroy your life. One site claims you will eventually end up in hospital, experience divorce and that your life can fall to pieces at any moment. Popular perceived dangers are people who investigate the paranormal for decades or spends long periods of time in supposed haunted locations. This apparently can cause poor living conditions (broke) and create emotionally unstable lives. Or, in my opinion, cause people to blame something unseen and unknown instead of taking responsibility for their own actions, habits and life choices or not seeking the appropriate medical professional help. Fear is a two edge sword too. If you hold fear about being spiritually attacked or bringing a spiritual attachment home with you, then regardless if it happens or not, your bias and belief in it will taint any experience you have as confirmation that you have brought a spirit home with you. Some of the advice on the internet about the spiritual dangers can actually be compounding the issue further. Well, let me re-frame that. Providing potentially damaging advice to a client in a private/residential case. What is considered dangerous? Investigators confirming with a client that they have something paranormal in their home even before a one of the first steps of a thorough interview has started. This often is more about the intentions or lack of experience from the investigator. If the intention is to investigate a haunted location and not genuinely help a person or family, then this dangerous. Private/Residential/Domestic cases aren’t alternatives to finding locations to investigate with reportedly haunted phenomena. If the reason for this claim is due to and inexperienced investigator, then this too is equally as dangerous. Cases like this shouldn’t be explored without learning from other investigators or reliable sources first. With all this you may wonder why anyone would want to investigate the paranormal at all. I’ve had my own experiences through the years and some I still can’t explain. Yes, I’m open minded to the possibility of it being paranormal but it’s not the first coloured dot I jump to in a game of Twister. The field is and can be dangerous. But the dangers are more with the living, behaving ethically and staying safe then any possible danger of the dead. Paranormal investigators use social media in many different ways. Some of use it to gain opinions or ideas in which to explain something that we may have recorded. Some also connect with other investigators as well who may also have possibly recorded something that could have been interesting. You are able to connect with other people who are also interested whether just starting out or having had years of experience, but of course there is a downfall. The written word can be taken six different ways due to so many factors like peoples different backgrounds, life experiences and ways in which they would read a message and take something and not see it for what its true intention was. And photos posted of people claiming there are ghosts in them can bring about some very robust conversations. A tip I recommend is keep the audio or visual of something that can be explainable as something to compare when you may possibly record something unexplainable. So if so much of this can be explained, why do people insist on posting such images on social media? I personally think it falls into 2 categories. This will always be difficult because the first problem is that you weren’t there at the time the photo was taken. You're really relying on their witness testimony on how it all happened and it's often just the one person. Sometimes if they've posted it somewhere and other people that were there at the time like other team members or the public they can help by giving their own accounts. This can help but it's really difficult to try and find out what actually happened when you weren't there and to me being in the moment and seeing something happen and then seeing what was recorded afterwards is so much easier when analysing than trying to diagnose why without being there to at least even understand the environmental conditions. Advice: “Usually” and not always people who are wanting legitimate advice will be willing to hear rational explanations but yet its still good to tread carefully. Say for instance they may not know how to use their camera or understand how it works completely and this can be revealed often in the way they have worded their question. Ask clarifying questions first, like if the photo was taken in IR light or what the weather was like at the time the photo was taken instead if going in guns blazing accusing them of not knowing how a camera works. This is the more difficult category as the people who post images and are wanting validation are not generally going to list to reason. They post with absolution that the image is a ghost/paranormal swearing that they were the only person there. Again, asking clarifying questions can help to understand what happened before the photo was taken during and afterwards but be careful since they often don’t want you to deconstruct the how’s and when’s. They want you to agree and that is where a lot of the big arguments come from. 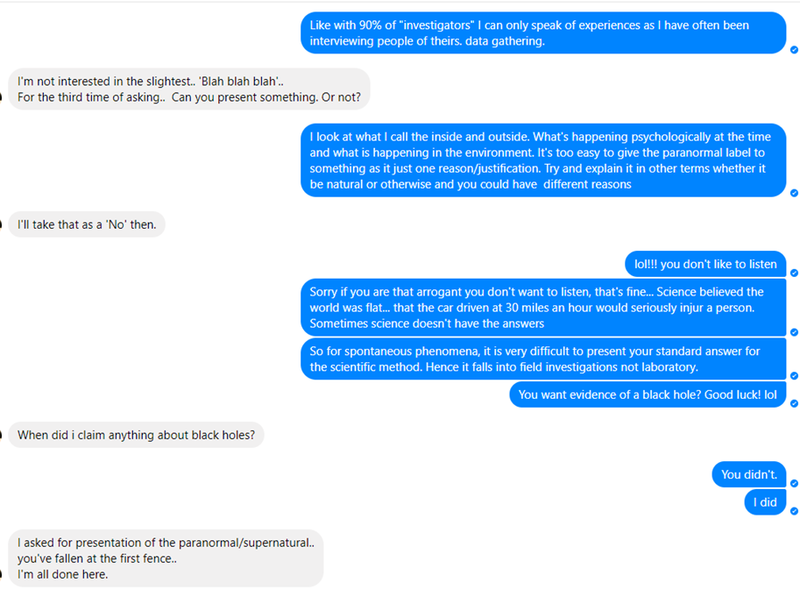 They want you to join the “yes its paranormal” bandwagon and not really looking for advice – even if they have asked for it. It can start of fairly innocently but again a lot can be learned from the way the question has been asked. It will be either a “What do you think? Ghost or not?” to “Guys I can’t explain this anomaly. I was the only person there. I think its real!”. I have in the past tried helping out but have found myself way in over my head.And that has been due to what has been termed as Sealioning (it’s different to Trolling). Sealions are generally friendly and they're very gentle and they'll gently approach you but as soon as they think that your food they'll attack you. It's this kind of mentality where someone has tried to gauge you and where you stand but as soon as you let them know that it’s not in their favour, they become angry. Say for instance someone wants validation they come to me and they're like “I've taken his photo I've would love your opinion” and I would and have often replied “well actually I think it could explained by something in the environment”. This is then met with “well you have no idea what you're talking about, I don't know why you know you even bother you know doing what you”. That is Sealioning. Advice: If someone approaches you and you know 100% that is isn’t paranormal in any nature, back away. You can’t argue with a person’s belief. They want an answer you’re not willing to give and any amount of gentle clarification won’t work. What do you reply with then if approached? “That’s interesting”. And leave it at that. Don’t take anything personal either. On social media nobody knows you from when you were knee-high to a grasshopper to where you are now your life, or your history, how you work, how you write everything you know. It's hard because sometimes when people do post information that they a hundred percent believe it could actually be something paranormal they may have also had a personal experience at the time of the photo and you can’t argue with personal experiences either. As far as being on social media? Stick to groups that are level headed and logical. There will be less chance of you coming across situations like this. So - The biggest difference in both categories is intention. One is to find more info, the other is to have misinformed gratification. Pick and choose your battle wisely. With many of us traveling further and further to check out locations that have reports of paranormal activity, some of us are starting to travel by aeroplane more than others. But as one can imagine with security at airports the way they currently are, some of the devices paranormal investigators use have chips, batteries and lights. Something airport security is always on the look out for. And then of course the challenge to explain what it is that you are intending to use it for – I’ve had many a funny look! So, what do you need to know to make sure you can take your gear with you to the next paranormal investigation? This is for 2 reasons. A) just in case you bump you bag you don’t then have something that is still switched on and then of course when you get to your location you have a device that is completely flat and needing new batteries already. And B) if you bag happens to be checked into the luggage compartment below, then if it’s on, it’s going to cause a security alert. 2. Keep your less pricey items in your checked in luggage and your more expensive items as carry on. On the very odd occasion that my bag hasn’t made it to my destination, I’ve at least got something to attend a paranormal investigation with. This can also help when going through security since they will often want to inspect your bag and you can be there for any questions. Another thing is tell one of the cabin crew that you have delicate items in your carryon and they should also help you store it properly (particularly if you have an expensive camera). 3. Wrap your paranormal investigation equipment in your clothes. You are going to want as much space to be able to buy things as well to come back with depending on where you are going. Using your clothes to wrap up your equipment means you’ve still got your clothes packed but you've also got your stuff wrapped up as well and that can be for fragile items like mugs and all sorts of delicate items. Of course when you get to the location you are then going to have to unravel your equipment but then what you can do is put them all in your smaller carry on bag and take that to the location. 4. If you can, always use hard shell suit cases to avoid possible damage. Again, this has been from experience and not a good one at that. When I flew to my first International paranormal convention I had a sports bag and I bought a couple of things back and almost all of it got smashed or damaged in some way. And this was even though there was a “Fragile” sticker on it. So make sure that you do have a hard-shell luggage. I bought a Samsonite one but you don't even have to purchase one of those, as long as it's got a hard shell it'll actually keep the in contents in your bag breaking. Baggage handlers have a job to do and often they're in a rush they don't care. So make sure that you've got something that's going to protect your insides of your bag as much as you can if you are carrying items that's going to be fairly fragile. 5. Be ready to be questioned by security. It will happen at some point and is often where the fun stories come from. I personally have had some very interesting looks when I've gone through immigration at LA airport and they obviously see they see my clothing as Access Paranormal. And of course it depends on the Airport. LA is huge and I was never stopped for an explanation for my back yet when I flew to New Orleans with the same bag, they took me back through security to open it again and I almost missed my flight. Side tip – keep all the boxes your equipment came in. That way you already have proper packaging when fliying if you don’t want to use an equipment case. Remember… space is way more restricted than driving. Ghost Hunting Apps - Do They Work? Ghost hunting apps – do they work? I’m first going to admit I've actually used one originally about six years ago and did so a couple of times. It was the ghost Radar – yes. But we do have to ask the question… do they actually work? Now, you are probably thinking that isn’t the kind of answer from someone like me, but I will explain. Firstly we'll look at the kinds of features that ghost apps actually claim to have. Some say they detect EMF and also “measure EVP”. But as we know as paranormal investigators you can’t actually measure EVP’s (Electronic Voice Phenomena) but can only record them. It's a sound that has been recorded audibly that wasn’t heard at the time. If it was heard at the time it's called audible phenomena so for something to be measured that you can't hear at the time is somewhat inaccurate. This would also lead me to believe that those who are making the technology and engineering these apps aren’t paranormal investigators. For example some apps claim they do “sound manipulation” which in reality is a fancy word for Ovilus. The Ovilus is also an app which is meant to use the EMF fluctuations in the atmosphere and this in turn is meant to trigger words from a built in dictionary. There are even some apps claiming to be temperature gauges. But the time I first used a ghost app to now, technology has certainly changed. My main aim was temperature, EMF detection and FM/AM radio. I had these apps open at home, on the train (yes I did have some funny looks) and even at work and luckily because of what I do at work I can have equipment at my disposal to confirm any readings these apps might produce. For instance, there are FM tuners in an iPhone and of course an Android, although it's digital it's not analogue. You can have the option of having an FM Tuner for your phone but it works as a separate attachment that you plug in. GPS is also in every smart phone which gives the indication that it can detect EMF and radio frequencies. I also tested out an app claiming to detect EMF by putting it next to my laptop and the reading was 0.5 miligauss. When I put my Mel Meter next to my laptop there wasn’t any readings at all. I moved it away and used the app again, and it had a reading of 0. I tried again with my Mel Meter and it still returned the same result of 0. So smart phones do have the capacity to “pick up” some EMF and they obviously receive RF but when it comes to detecting they aren’t very accurate. There is also a temperature gauge in a smart phone that is not only temperature but pressure as well which ironically is good for people who are out fishing. Have you ever had your phone overheat and it has a warning message appear? That’s the same technology working right there. As for those out fishing, if there is a decent change in barometric pressure they know a storm is on its way. And although this is useful, smart phones don’t have the technology (yet) to detect “ambient” temperature. So, I tested one app that claimed to be a temperature detection and as soon as I opened it once downloaded it said that the temperature was 37 degrees Celsius (about 106 F). And, it certainly wasn’t that temperature at all! There are however little devices you can actually buy and plug into the actual phone. I think it might even be a certain socket that you've got depending on the make of your phone and you can actually plug that in and it can detect temperature. So that's the best way if you want to use your phone for temperature readings but the apps out there at this point in time can’t detect ambient temperature. If you are going to use these apps (and it's up to you) I would use them in a social setting with friends and not in a paranormal investigation. Especially the Echo Vox or Ovilus – it can be quite entertaining. These phones have the capacity to run these types of functions but not at the level and advanced or sensitive nature that investigations need. I’m a little old-fashioned and I prefer to use a device that actually does just what its designed to do. You are going to get better quality and also more accurate readings. So, for instance, my Mel Meter. It has the antenna as well for the REM function and it has temperature detection as well as the standard EMF (I won’t be using a Mel Meter to make a phone call!). My biggest concern though, is that there may be people that feel something possibly paranormal is happening in their home and they turn to these apps to help find answers. I wouldn’t advise it if this was the case because they are fairly inaccurate. And if you are still looking at purchasing these apps, they all claim to be for entertainment purposes only. But try it out, see how you go. I would use them in a social setting and definitely not during a private/residential/domestic case. Test these apps out for yourself, take notes, do research, repeat the testing in different environments, see if there is a pattern, see if there is a difference of quality, and make your own analysis. As paranormal investigators having practical field experience is important. It's often how and where we start gathering more questions about how people experience possible paranormal activity. But what is equally as important is also looking at other ways that these experiences can be explained other than looking at the afterlife. One such conjecture (possible thought/idea) is taking a glance at physics and the Multiverse theory. So what would this theory be about that might help explain intelligent (interactive) or residual (non-interactive) haunting cases? Let's break it down. Multiverse is a theory that states that there are many different universes that were created randomly with our universe being one of them. These universes were randomly created and because our universe sustains life this gives a possibility to the fact that life could be existing elsewhere. But the most intriguing thing is that life could be existing but in a slightly different way to what is being experienced nowhere in this world. Because there could potentially be billions of universes, there is a likelihood that there may be another version of you doing something similar or very different. Well, scientists don't really know 100% what shape space-time is. But there is the idea that its liner - a straight line. It is thought to stretch out indefinitely but also it could very well "repeat" because it's infinite. And that is where the idea that there could be another you somewhere in another universe - an alternate reality. So instead of that decision you made to move to another country, this alternate life you would have chosen to stay and hence it would play out the outcome of that decision and possibly many others. Possibly within this multiverse are what is termed as "Parallel Universes" that are meant to run alongside our universe. This is due to the idea that there are many more dimensions than the understanding of space and time as we know it. To add to that, some scientists believe that universes can collide with each other causing big bangs and other universes to be created. Now, what does this have to do with the paranormal? Well if people are witnessing apparitions of the past, could it be a time slip from another universe? Maybe it could also explain how people have claimed to see someone who is still alive in one location to know that they are in another one. And what about residual/ non-interactive apparitions? Could also help explain those too. Did a parallel universe "cross over" into ours for a moment? Was the apparition of a person who is familiar happen to be from another dimension? As is often the case, we begin to find more questions than answers but Multiverse and Parallel universes are interesting theories and some that are well worth keeping in mind when researching possible paranormal phenomena. A simple video to further explain the multiverse theory. Should we use the word “Evidence” with paranormal investigating? Most paranormal investigators use the term “Evidence Review”, “Paranormal Evidence” or “Scientific Evidence” but in all honesty, should we? What’s the harm right? Paranormal Evidence just means you have captured something that could be paranormal. But… is the word evidence the best term to use? Some may say I am picky, so let’s have a look why this word may not be the best description. Firstly let’s look at the definition of the word “Evidence”. According to the website “Wag the Dog” (https://vigornotrigor.wordpress.com/2014/07/01/data-vs-evidence/) Data is factual information such as numbers, percentages, and statistics. Evidence though is data that is relevant and furnishes proof that supports a conclusion. So, in a nutshell evidence is supporting something that is true and correct. And, this of course is where it gets somewhat messy. Science as it stands today says there isn’t an afterlife, ghosts or spirits. Yes, this could change one day (science also declared the world was flat) but for now, this is what we have to respect and remember. Investigating claims of possible paranormal phenomena doesn’t have to be carried out by those who believe in an afterlife. In fact in some instances it’s almost preferable (for myself though, I’m open to the possibility of an afterlife). But is there any refutable evidence of it? No. Not yet anyway. Then there is after an investigation. We begin to review the recordings taken and we often term this as “Evidence Review”. This again is tricky. It indicates that we already have found proof of the afterlife – even before we have analysed any footage. Well, after the last point, you can start to see more of why this term seems obsolete. As it stands, unfortunately there is no such thing as paranormal evidence. When investigators say they are “looking” for scientific evidence, they are in fact looking for something, an anomaly, that they can’t explain and could possibly be paranormal. Scientific evidence could be better explained by investigators as the fact we are using parts of science to help explain our environment and what is happening with our minds. But looking for scientific evidence of the paranormal may not be the best way to explain it. For something to be considered scientific evidence it needs to be studied over time and repeatedly studied too using experiments and gathering data for research. It also has to be conducted unbiasedly with experiments carried out in a controlled environment and peer reviewed. So, using the word evidence may not be accurate. So what term(s) do you use instead? If you and your team are serious, you are gathering data to research further. If you’re using recording equipment to monitor your environment then you are also data gathering. If you are reviewing recordings from a paranormal investigation, then its footage analysis or video/audio recording analysis. As paranormal investigators, we deserve the respect for the work we do but to start gaining that respect we can start using the right terms. Some would say I'm pretty brave for writing such a blog post. But, I've always been a big believer in having a balanced view when it comes to paranormal investigating. Critical thinking is a dying art and I follow many skeptics around the world often agreeing with their comments and research (Hayley Stevens and Kenny Biddle to name a few). So let's start with the obvious. Ghosts don’t exist. It’s a fact. And as paranormal investigators, we need to respect and remember it. Often scientific terms that investigators use are thrown around without the true knowledge of what they mean. Terms like “Stone Tape Theory”. A theory isn’t actually what it is. It’s more a conjecture or as some would say speculation. A scientific theory is a way to interpret facts so it’s not really the correct technical term. And not everyone who investigates knows that. But guess what – that’s ok.
Why? Because the word theory is used in everyday language as a possible idea. Most people who start out as investigators don’t have scientific backgrounds (SHOCK! I know!) and know it's true correct meaning. Again. This is ok too. All it takes is a conversation explaining this. No one has to die in the process. And I guess this is where I have my gripe with Cynical Skeptics. People who investigate should know some basic terms but not everyone does at first. 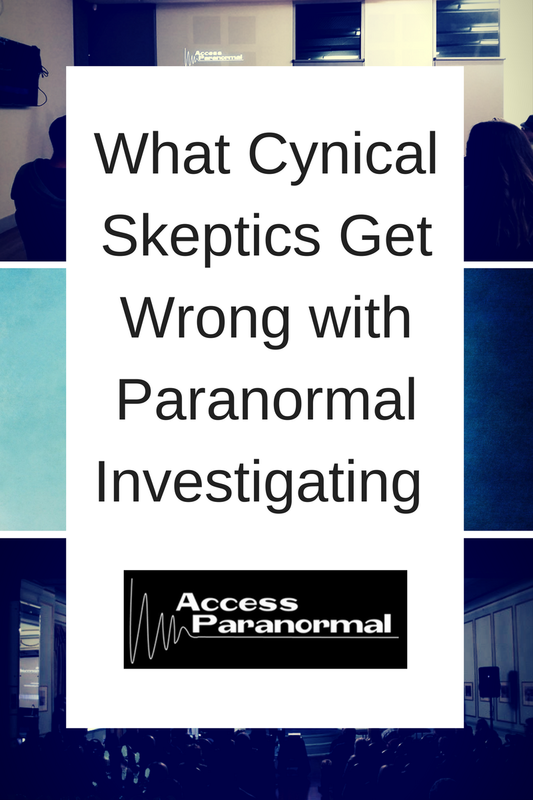 What cynical skeptics also fail to do is actually understand that there are many reasons why people choose to investigate the paranormal. And it’s not through studying any type of academic qualification. They often point the finger and shout “you don’t know what you’re talking about” and “what you’re looking for is unfounded – you’re wasting your time!”. Rarely is there any constructive suggestions offered, but paragraphs and paragraphs of authoritarian proofs. It’s no newsflash that we as humans haven’t found the answer to everything. This includes the universe and how our amazing brains work. There is also no evidence that there is an afterlife. But science also said not that long ago that the world was flat. What does this mean? Things can change. Ok, when the afterlife is concerned it would have to be a pretty big breakthrough. But still. It’s a possibility. Some things investigators do are based on what some would consider “flaky” conjecture. But people are and will try different things. I often encourage it. I also find cynical skeptics brand a lot as “pseudoscience” and be done with it. It’s like a “believer” branding an experience as paranormal… being bias to the survival hypothesis. It’s one answer. It’s safe so you don’t have to try and open yourself up to the possibility that there might be more going or in some cases less. So, cynical skeptics. You know you can't argue with a persons belief. Again, this goes both ways. It's knowing when to hit the ball or when to let it go to the keeper. Maybe it might be better to not berate people for looking to learn more or being interested in this topic. It's still out of the normal boundaries of what science can explain (so far) and finger shaking at those who may just not be aware of common scientific terms - the unknown is the unknown. Which means things can change and being encouraging and approachable might actually be the way forward.